The maroon carpet of the ballroom reminded me of drying blood. Booths ringed the outside walls and formed a back-to-back row down the center of the room. Some sat empty, with business cards and leaflets full of promises strewn on the table. Others had people behind them looking hopefully at the handful of folks at the coffee station. I poured myself a cup, dosed it liberally with cream and surveyed the wreckage. I knew most of the companies. I had visited a new gold discovery, up in the mountains in Mexico, with a team from one of the companies. The CEO sat at his booth staring at his phone. I know that this gold discovery could easily lead to the acquisition of his company … and tack a zero onto the market value. The booths held some of the best junior natural resource companies in the world. These are the companies that find gold, copper, silver, etc. The deposits that become tomorrow’s mines. They represent big risks and big rewards. From 2009 to 2011, the index more than quadrupled. Juniors are the tiny companies, usually below $100 million in market value, that populate the Toronto Venture Index (TSX-V). This group spent the five-year bear market from 2011 to 2016 falling. No one wanted them. By the time the sector found a bottom, there were companies that traded below the value of the cash in their bank accounts. They bottomed late in 2015 and rallied into 2017. But they’ve spent most of this year in decline. The whole index is down 17% so far in 2018. In the chart, the orange line shows the index value, and the blue line shows the volume of shares traded. The last time the volume was this low was back in January 2016. The companies themselves are in good shape. Most of them have plenty of money. Most of the companies in the room had actual projects. Summer is the time these companies create value through exploration and drilling. The problem is, no one cares right now. It could be the trade war, the tiff with Iran or extended summer vacation. 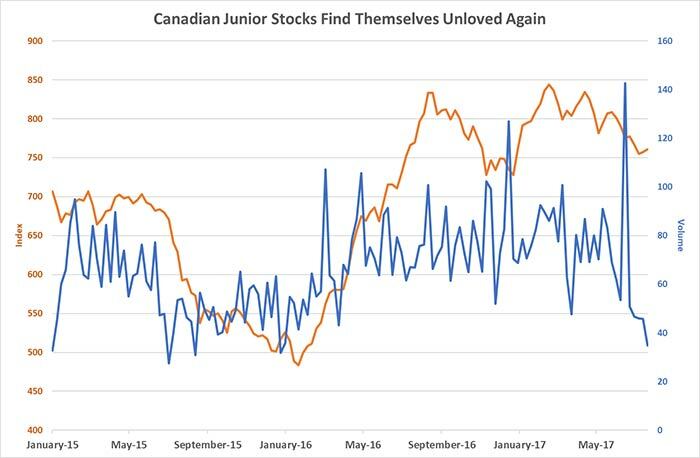 Whatever the reason, investors don’t care about junior mining stocks. As I told the readers of my Front Line Profits advisory service, this is a buying opportunity. We own a portfolio of companies with real discoveries, like the company in Mexico. Right now, these companies are becoming more valuable and less expensive. Today the market doesn’t care, but it will soon. And we’ll be there to sell it shares at much higher prices.